When I was teaching enormous numbers of business students (via telephone - about 300 per busy season), they often talked about building brand name loyalty with their customers. These were companies like Toyota, Sumitomo, Brother, and Nippon Denso. In their cases, loyalty meant some pretty big bucks as they didn't sell tiny things. The way in which they cultivated this greatly valued loyalty was to lavish attention on customers who worked at the upper management levels. They sent out the same salesman and he'd sweet talk the client. After years of working together, it was that much harder for the customer to move along to a cheaper vendor. Snack companies don't have the luxury of taking it to the customer on that level - both because they have too many of them and their products are so low margin. So, how does a snack company build brand allegiance? It's something that I pondered because I tried this Riska product, loved it, and then realized the brand makes a good number of economical and tasty snacks, but no one pays much attention to them. If I look back through my blog at all of the Riska products I've reviewed, I liked every one of them and two of them, Corn Potage and Heart Chipple, are in the pantheon of my all time favorite salty snacks. I'm wondering what it is that Riska isn't doing to build brand loyalty. In my opinion, they have the goods, but they don't have the profile. Someone at Riska should get on that. And, they should also try to export more of their products to the U.S. 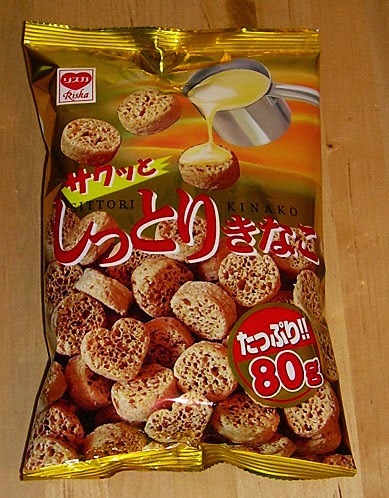 This snack is a kinako (toasted soy flour) version of the more common chocolate variety. Like the chocolate version, this has a somewhat puffy, but crisp corn base. You can see from the picture that they're rather airy. Think about the inside of a corn-puff snack with bigger air holes (like an expanded and less crispy Cheeto). 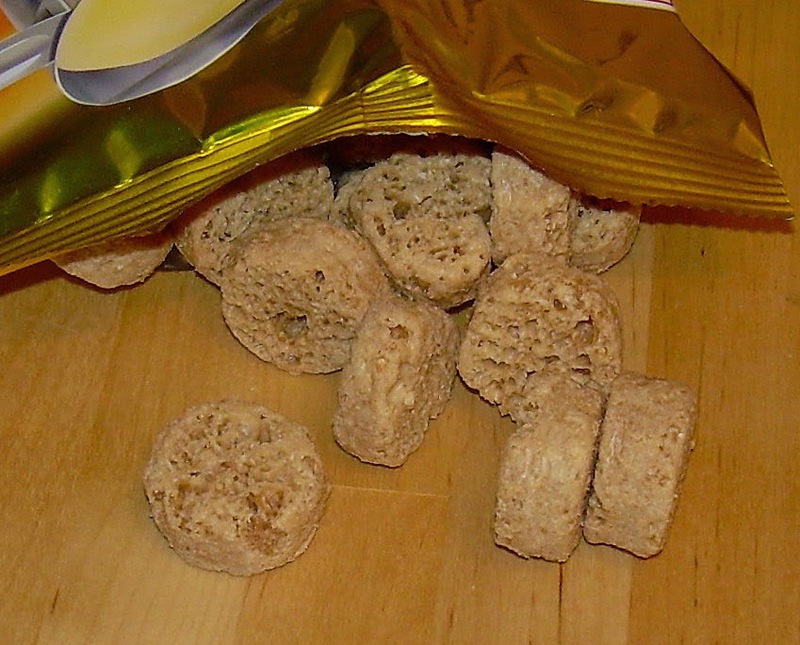 "Shittori" means "moist" and the crispy nature of these corn puffs seems to be softened a bit by the white-chocolate based coating. The coating is flavored with kinako, so it has a bit of the nutty soy flavor that one associates with toasted soy powder. It's sweet, but far from cloying and the kinako flavor pairs very well with the muted, earthy corn flavors. It's a much better match than the chocolate in the original version. A whole bag of these is 80 grams/2.8 oz. I paid $1.58 (161 yen) at Marukai Japanese market (a veritable bargain for a Japanese import). It's a lot of snack for the price and the whole bag is 446 calories. However, it's supposed to be three servings so it's only lethal if you pig out. Tempting as that may be, I've found that you enjoy them more if you put some limits in place as the acclimation to the taste will limit your enjoyment over time. I loved these, but I also love kinako. I would definitely buy these again and I hope that Riska ups its brand profile and gets into more markets. Even in Japan, I tended not to see them everywhere and it's even harder to find them here in the U.S. If you can find them, I'd recommend giving them a try.